To commemorate the bicentennial of composer Frederic Chopin (1810-1849), the Atlantic Harp Duo dedicated the year 2010 to producing a narrated concert of Chopin’s life. Their careful selection of original harp duets and sensitive transcriptions of piano works, woven together by their elegant and refined text, takes the listener through the musical culture of Chopin’s era. 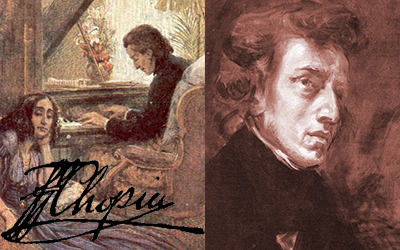 Born in 19th-century Poland, but later exiled due to political upheaval in his country, Chopin settled in France, where he lived a passionate relationship with novelist Georg Sand. They recorded the entire program at the Foellinger Great Hall of the Krannert Center for the Performing Arts in Urbana, IL, and self-produced their premier CD, now available for purchase at major online music distributors. Visit the discography page for more information.